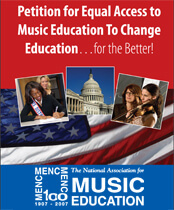 MENC: The National Association for Music Education, has been working to collect signatures for the organization's Petition for Equal Access to Music Education which is intended as a mandate to legislators that music and the other arts be included as part of every student's core curriculum. With a goal of one million signatures, the petition will be presented to the new U.S. Secretary of Education during a rally that will take place as part of MENC's Music Education Week in Washington, D.C. from June 17-23. Recently made available online, it's now easier than ever to make your mark in support of music education. Visit ThePetitionSite.com to sign the MENC petition today.